The regions of Campania, Puglia and Calabria are located in southern Italy; these areas make up the heel and toe of the country. So also Sicily, the island that got kicked into the Mediterranean. I'm sure this was how many of us learnt about Italy in Geography class. The reason for this quick brush up was because of an invitation to Focaccia, Hyatt Regency Chennai's trattoria style award winning restaurant to review their new offerings. Chef de cuisine, Roberto Zorzoli from Milan has put together a new weekday menu that reflects the specialties of southern Italy. There definitely was going to be a lot of tomatoes and olives. My friend and I decided to go for a midweek lunch and not surprisingly, as it was a festival day, found ourselves the only occupants of the restaurant, except for a big group of people in the private dining area. Which meant the service staff pampered us with plenty of attention. Also with us was HRC's PR Manager who gave us a brief overview of the new menu before rushing off to attend a meeting. As for the menu, it was a mix of new dishes and popular older ones. We left it to Chef Roberto's more than capable hands to make the selection. Our only request was to serve us a half portion of anything he wished us to taste. A basket of focaccia and an intensely delicious tomato dip was served. The bread was supersoft and was the perfect accompaniment to the dip which had all the colour and flavour of tomatoes and herbs and perfectly balanced acidity. We started with polenta e fungi, squares of polenta browned in a hot pan and piled high with sauteed mushroom trifolati - a medley of button, shiitake and porcini slices. We loved the various textures of the mushrooms and the blandness of the polenta was the perfect balance to the earthy flavour of the mushrooms and we used it to mop up all that delicious sauce. Then there was beef carpaccio topped with olives and ricotta - wafer thin slices of tenderloin cured with sugar and salt. A drizzle of truffle oil enhanced the look of the dish and the curing process ensured that the meat had been slightly "cooked". Rocket leaves, as stated in the menu would have been an interesting combination with the meat but alas it wasn't available that day. Chef Roberto made us an insalata caprina that had plenty of julienned carrots, slices of tomato, salad leaves and a tangy dressing. Topped with goat's cheese, walnuts and pine nuts, there was plenty of crunch from the carrots and nuts and was light on the stomach. A choice of 3 soups and we opted for the traditional minestrone. Served with pesto smeared crusty baguette, it was terribly delicious. Slow cooking of the vegetables had resulted in the flavours becoming amplified; the cubes of vegetables included zucchini, carrot and pumpkin. 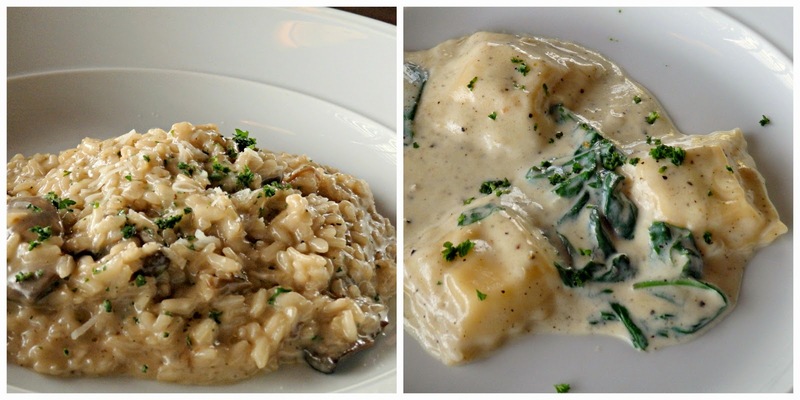 For the main course, Chef Roberto sent across his signature risotto al fungi. It had porcini mushrooms, Parmesan cheese, wine, and a delicious stock that had been cooked into a riot of flavours. A drizzle of truffle oil adorned it but the only thing that took away the perfection of the dish was that the rice was slightly underdone. In his charming Italian accented English, the chef asked us if it was "too little al dente" and offered to make us another portion. No, no, as we had spotted the ravioli di salmon making its way to our table. Cute little house made ravioli parcels stuffed to bursting with pink salmon in a cream sauce and topped with baby spinach. Delicioso! How can anyone turn down dessert? We were going to when the chef said we simply had to taste his cannoli Siciliana - crisp pastry tube filled with ricotta cheese and candied fruits, chocolate chips and chocolate sauce dizzled over. We loved the crunch of the pastry and the cheese that had just the right amount of sweetness. There's plenty more on the menu including rustic lasagna, green ravioli and risotto with prawns and zucchini... and pizzas from the wood fired oven...sigh...and soft centered chocolate...Sigh!! It was a long languid lunch, every now and then we'd look out at the mess of traffic on the main road below. The only distraction was the glass window that needed a good cleaning. But then again, I'm just nitpicking. Call +914461001234 to make a reservation. And don't forget to order the minestrone.